Li Shufu's business savvy has made him one of China's wealthiest people. SHANGHAI (Reuters) -- Li Shufu, the founder of China's Zhejiang Geely Holdings, has much in common with Henry Ford, from a childhood on the farm to a scrappy determination to build an automaking behemoth from nothing. If discussions underway between Geely and Ford Motor Co. are successful, he may have another link with the great industrialist -- ownership of Ford's Volvo unit. Li's Geely, which means auspicious or lucky in Chinese, has captured the imagination of car buffs worldwide with its dark-horse bid for the well-known but money-losing Swedish brand being sold by Ford. "Li is a man full of ideas," said Chen Qiaoning, an analyst with ABN AMRO TEDA Fund Management. "Some of those ideas have worked. But the Volvo deal could turn out to be a big disappointment even if it wins the bid, as cross-border auto deals have seldom led to happy marriages in China and elsewhere." Born in 1963, Li comes from eastern China's Zhejiang province just south of Shanghai, known for churning out some of China's best and brightest entrepreneurs. 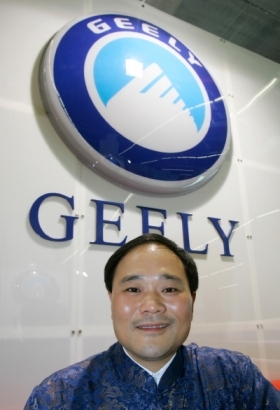 A mechanical engineer by training, Li disdains such high-brow activities as golf and lives in a modest apartment in Beijing, said Lawrence Ang, executive director of the publicly traded Geely Automobile. Now one of China's richest men, Li's trajectory began modestly. After graduating from high school, he used a small graduation gift to buy a camera and open a photo studio in his village. He put earnings from that business into an operation salvaging gold from discarded appliances before moving into the a refrigerator parts business in 1984. Motorcycles were next, as he took over an ailing state-run firm in the mid-1990s and turned it into China's best-known domestic brand. He later moved into cars, and built his company into China's largest privately held automaker, aiming to sell 250,000 vehicles this year. Like Henry Ford, who the Economist magazine compared him to, Li's focus is on the mass market with models such as the Free Cruiser and Geely Kingkong, which sell for as little as 40,000 yuan ($5,859). In contrast, Volvo's top of the line XC90 sells for up to $205,000 in China. Hong Kong-listed Geely Automobile has seen its stock soar more than eightfold since 2006, including a more than four-fold jump this year alone on high hopes for the Volvo bid, strong sales in the world's largest car market and a major investment by Goldman Sachs. But Li's apparent early distaste for politics -- a mainstay in China and key to doing business there -- also cost him along the way. His lack of political savvy and government connections almost kept him out of the auto business altogether due to China's complex licensing and permitting requirements. "He has always wanted to make cars, but the government did not issue him a license until 2000," said Ang. Since then he has become more practiced at navigating China's political waters, and now serves as a member of the Chinese People's Political Consultative Conference, a largely ceremonial political advisory body. Li, who has said he sleeps in his company's Hangzhou headquarter most nights, is now pressing forward with the Volvo bid just months after another Chinese company, Tengzhong Heavy Industrial Machinery, inked a deal to buy General Motors Co.'s line of premium SUV maker Hummer. He does so, however, with a modesty that would not have come easily to Henry Ford. "Volvo is like a mysterious, beautiful woman," he told the Wall Street Journal in April. "We just look at her from far away, amazed. We don't dare get close to her. We're just a bunch of farm boys."